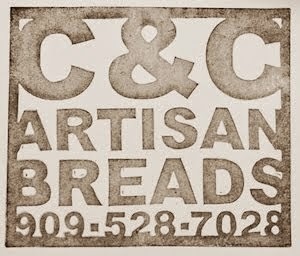 As you might imagine, I spend quite a bit of time scouring forums to read about other peoples' experiences with bread. There's endless things to discuss. Anything as subtle as orchestrating the activities of a symbiotic culture of microorganisms by controlling time, temperature, and a limitless variety of ingredients is bound to spawn a long and rich discussion of grand successes, abysmal failures and everything in between. One thing that pops up every once in a while is some panic-stricken baker who is reaching out to the forums in desperation, wondering what to do now that they've accidentally baked their starter. I always have a private chuckle when I read these posts. "What sort of idiot would be stupid enough to bake their starter?!" Today, I baked my starter. I was going to be in the mountains today, but we decided to stay local instead. 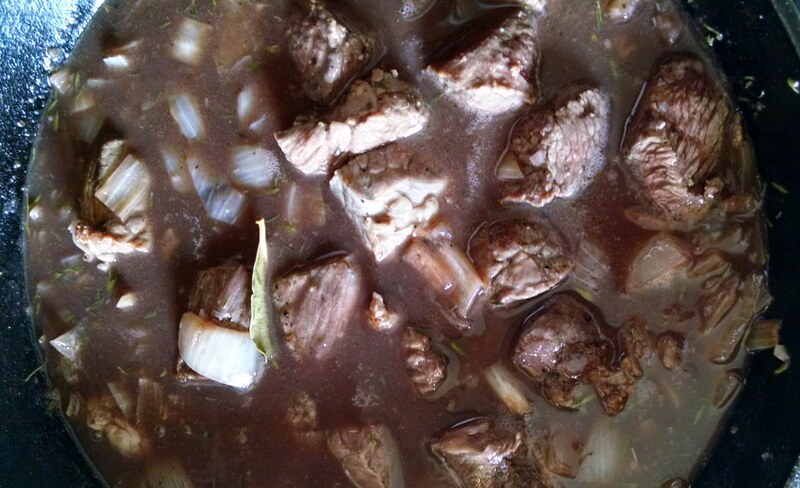 As I'm unable to actually not do anything for more than three or four seconds, I decided that I'd dig into a great book (The Best Recipe) to see if I could improve on the beef stew that my mom taught me to make, and that I've been cooking for more than 25 years. Their method called for cooking the stew in a dutch oven (already do that...) and going from the stovetop to the oven after everything comes to a simmer (that's new!). As it's a holiday weekend, I knew I needed to double up on the bread dough I'd make on Tuesday. Tuesday's bread dough was started on Thursday night, the dough mixed on Friday, bulk fermented then shaped on Sunday night, and is now retarding in the fridge for tomorrow's bake. Trust me, it'll be fine. But the holiday means that I have to work Monday's bread into later in the week, so I have to start the levain today, mix the dough tomorrow, then bake two extra loaves on Wednesday and Thursday, respectively. That means I need twice as much starter as usual. So this morning, I set about doubling my starter. I don't keep an independent starter. Without getting into too much detail, I bake so often that I can just "steal" a little starter from each day's levain. 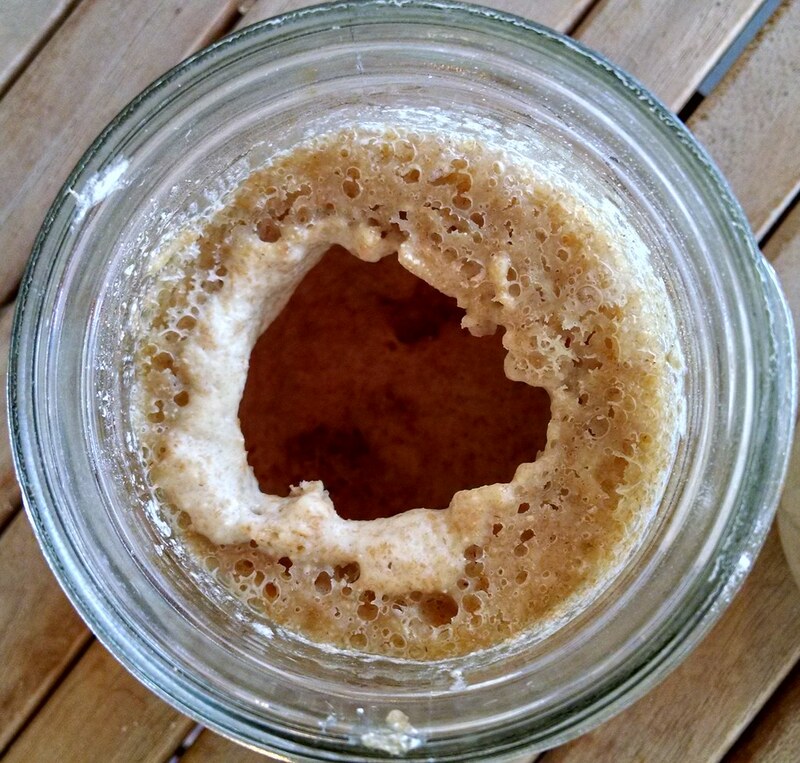 So I always have a mason jar that's either empty or has just enough starter for the next day's bread. When I need to make more bread on a particular day, I increase the starer before mixing the levain. That's what I tried to do today. But it's a bit chilly, so I used a baker's trick; I put the jar of starter in the back of the oven near the oven light and turned the oven light on. This creates an environment that's about 10 degrees warmer than your home's "room temperature;" just right for getting a starter good and lively, but not too sour. I read that I was going to have to cook the stew in the oven, and I thought "gotta get the starter outta there. No way I'll forget...the light is on, after all." Then I got started later on the stew than planned. A stew that takes three hours to cook. Browning the peppered and salted beef in a little olive oil and consulting the cookbook while chopping the onions, I casually turned the oven on to preheat. 250 degrees. It was probably 20 minutes before I realized my error. I'm sure that Cam thought I'd severed an artery or something. I reached in with my bare hand (I deserve what I get at this point) and grabbed the pint jar of what was once a nice and lively starter, and pulled it out. Immediately ("Cam! Turn the browning beef!") 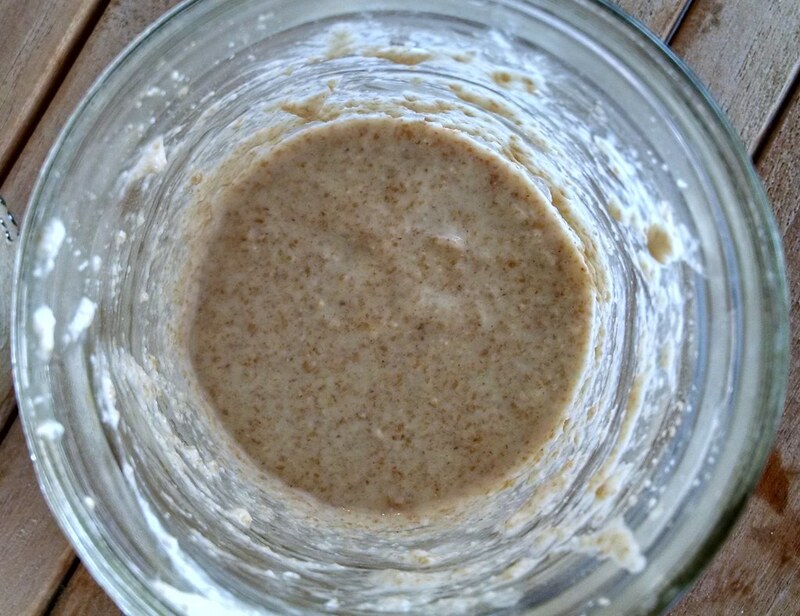 I spooned out the very middle of the cooked starter mess and moved it to a new jar to try to save it from disaster by dousing it with cool water and giving it a fresh feeding of my whole wheat starter mix. Time will tell if I was successful. If I was, then this week will be okay, and the bread share might be delayed a bit. I'm sure it'll be fine, but like I said, there could be some delays. Baked (left) and (hopefully) salvaged starters. Fingers crossed. 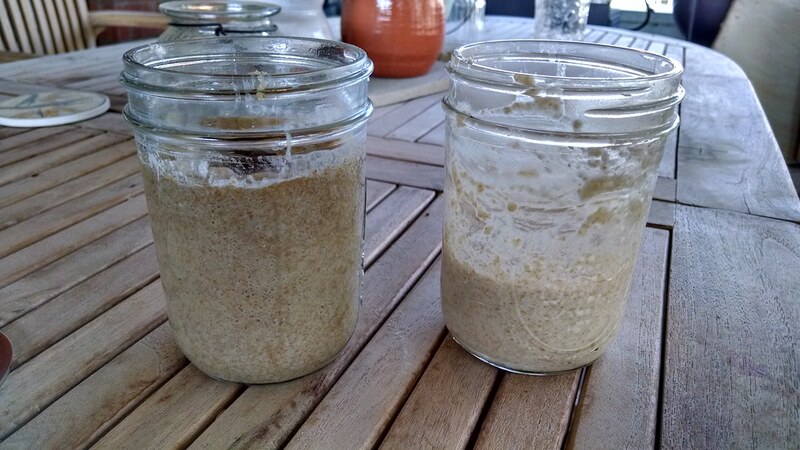 This is what you want your starter to look like when you mix it. I'm hoping there are enough of the little critters alive in here to keep things going strong in the starter. Cooked Starter. This is the worst case scenario. The starter at the edges of the jar was thoroughly cooked. I'm hoping that what I scooped out of the middle is still viable and will produce a healthy starter again. This is the beginnings of the stew that may have been the death of my old starter! I'm confident that the starter will bounce right back. Even if it doesn't, I have a long-term plan to create a starter from nothing but 100% whole Redlands flour and water. That's something I've shelved because I've been too busy to really give it the thought and consideration that it deserves. This might have just been pushed to the forefront! Ha! Actually, I have a good backup plan. I can either culture a new wheat starter from my rye starter, which started as my wheat starter anyway...or I could pinch a little dough off tomorrow's bread to bring the starter back to life. I really, really hope that the cooked starter just fires back up again though, since I've had it going for a long time. This week's bread is sure to be a good one...It's like the country wheat, but with half rye, half wheat, and more whole grain than normal.